Espressif's ESP32 is a rather unique chip: it supports both Bluetooth and WiFi. 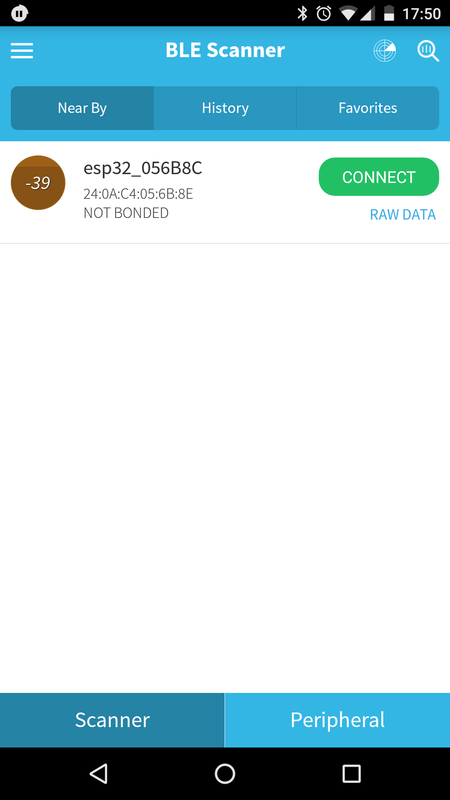 While WiFi support has been in Mongoose OS from day 1, we began working on adding Bluetooth support to Mongoose OS only recently and would like to share the first results of that effort today. 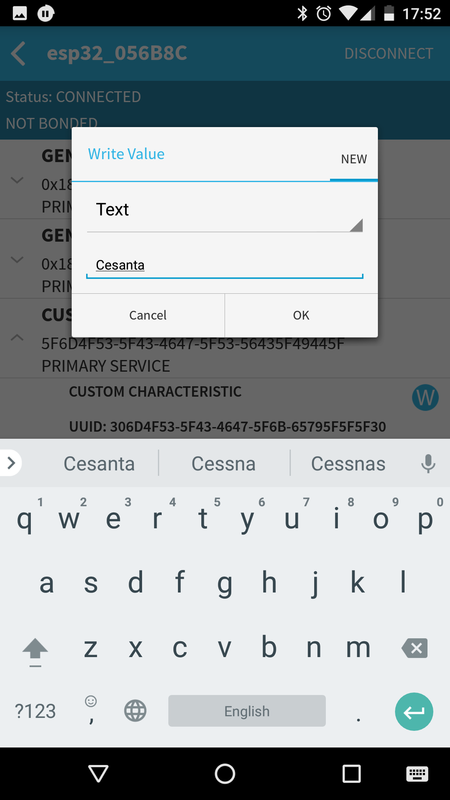 Bluetooth is an umbrella for a diverse set of protocols and functionality, and in our work we decided to focus on provisioning first: how to get device connected to WiFi without physically attaching it to a PC to enter configuration? 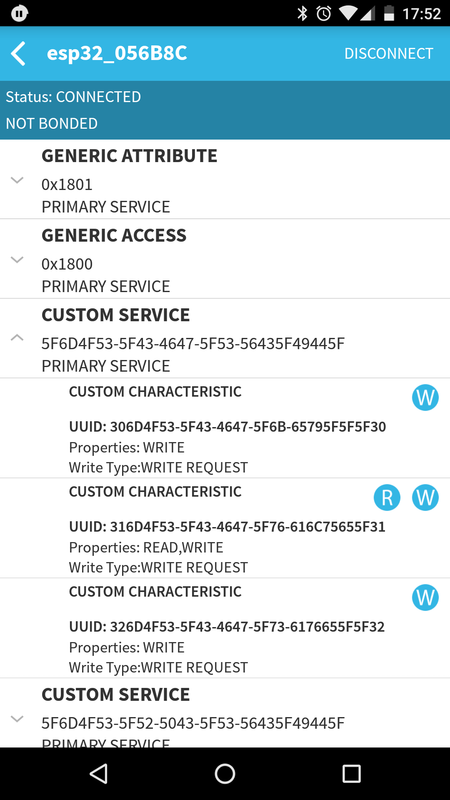 Part of the Bluetooth spec are Generic ATTribute profiles (GATT), which allow device to expose a set of attributes (also called characteristics), which can be queried and modified. There is a set of predefined profiles for common functions such as blood pressure and heart rate monitors, battery or even HTTP proxy. However, applications can implement their own profiles, and that's what we did for Mongoose OS: we implemented a configuration service that allows modifying the system configuration (see overview of the configuration system here) and an RPC service, which allows sending and receiving RPC requests over BLE (see more details about our RPC subsystem here). And because attribute profile is generic, there are existing apps that can work with this facility (this is in contrast with Espressif's own blufi provisioning mechanism, which requires a special app). Now, let's see how it all works. Now, get yourself a Bluetooth Low Energy app. There are quite a few available, we'll use the one called "BLE Scanner" (here it is for Android and iOS). Note: Left hand side screenshot is for Android and right hand side screenshot is for iOS. The one starting with 30 is the write-only attribute that specifies configuration key to change, we'll call it key. The one starting with 31 is the value attribute, reading it (after having specified the key) will yield the current value, writing it will enter the new value for a config key. The one starting with 32 is the save control point: when written to, it will apply the key and value entered. Note: Android app keeps them nice and in order but iOS does not, so pay extra attention. Now, let's enter the WiFi network name to connect to (technical name - SSID). It's controlled by the wifi.sta.ssid configuration key and value is a string - the network name. 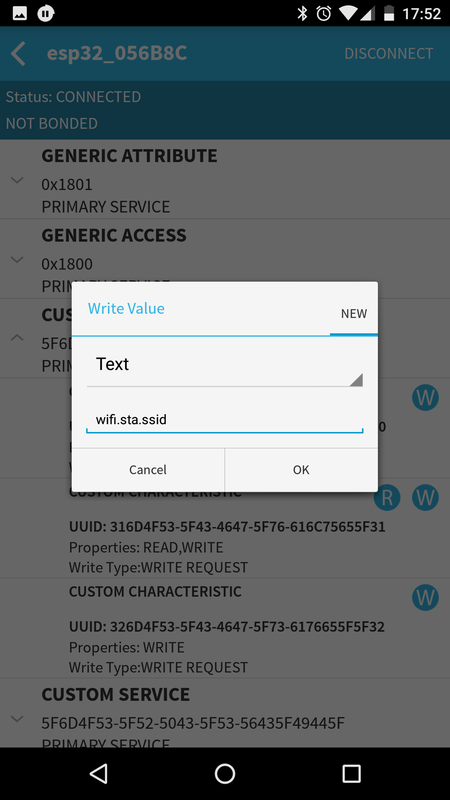 Use the same 3-step process to set wifi.sta.pass - the WiFi network password. If your network does not require a password, enter a single hex byte 0x00 into the value attribute. Please note, the last two lines: the default behavior for Bluetooth is to disable itself, once successfully connected to WiFi. The reason for that is, as you may have noticed, no authentication was required to modify device's configuration. 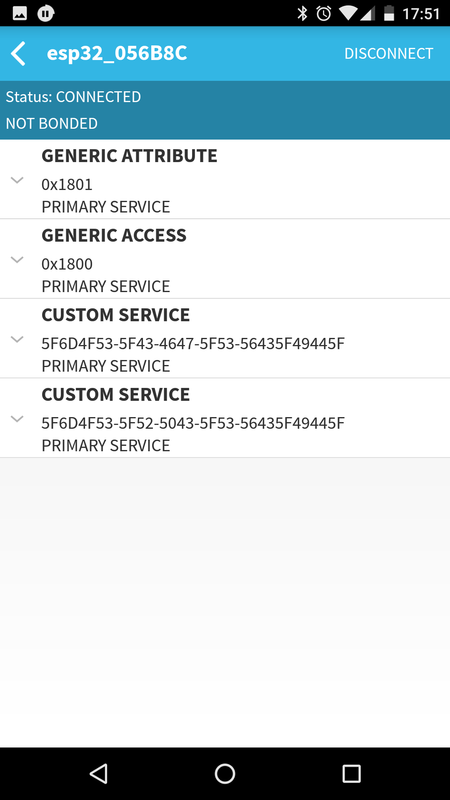 Currently, there is no way to protect these Bluetooth services. Expect this to change in the future, but for now the default is to shut them down once the device has been provisioned. If you want to keep BT running after WiFi is configured, you'll need to set bt.keep_enabled to true. So, this is all for today. Go ahead, try it yourself. If you have any questions or comments, hop on our Gitter channel, post to our forum or send us a message.